The second photo was taken at the back of this beach, at Ravenscraig, near Kirkcaldy, and is of a fly sitting on an Oxeye Daisy. 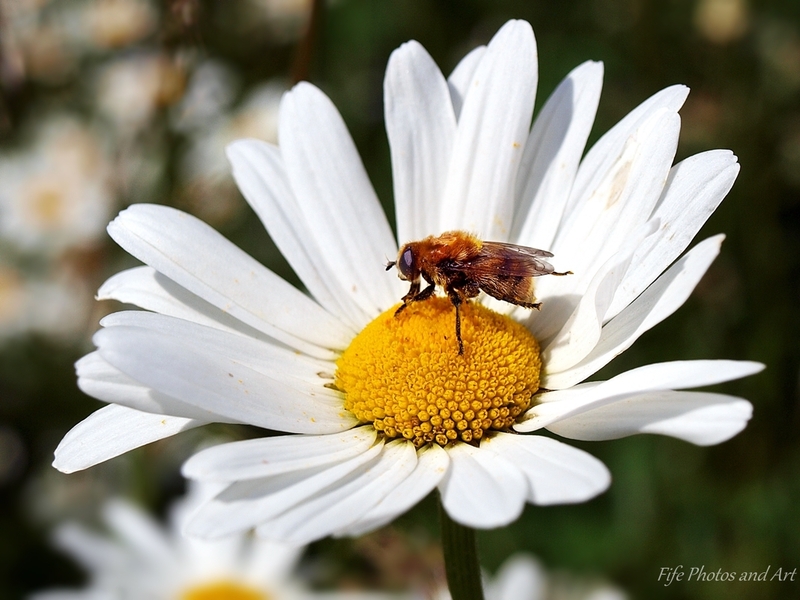 This entry was posted in Fine Art Photography, Weekly Photographic Challenge, Wildlife and tagged Fife, fly, insects, Kirkcaldy, nature, nature photography, oxeye daisy, Ravenscraig Beach, Scotland, Weekly Photographic Challenge, wild flowers, wpc. Bookmark the permalink. Great photos, especially the one of your dog! What a beautiful companion! 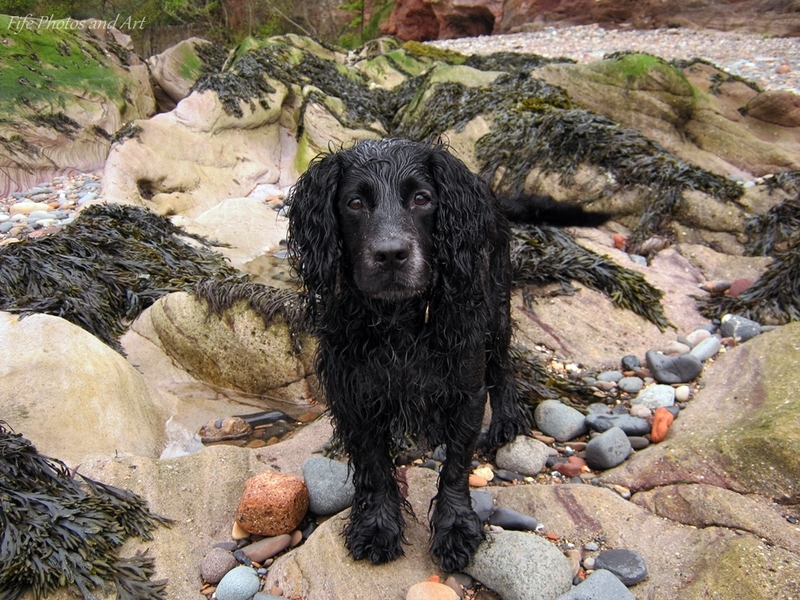 I especially love the sea weed and rocks in the background of the dog photo. You really have a knack for capturing stunning images, Andy! Thanks Lori 🙂 Jake is a brilliant companion to take out with me, and he can be quite photogenic, when he stays still for long enough! Lol! Such an adorable doggie! love that picture for sure. The flower and the bee are so lovely! just pure beauty! Thanks Tom 🙂 You quite clearly love your dog, and that’s always really good to hear!! And you’re right, Dogs definitely rock!!! Great macro there, Andy. And I adore your dog. He looks so loveable. Thanks Amanda 🙂 He is an adorable dog, I’m sure you would love him! Jake is handsome and what an expressive face he has! Gorgeous picture of your very photogenic dog – such a great pose!! Jake is totally adorable and these are absolutely stunning shots Andy! How I would love my hair to look like that when I am ‘bedraggled’. LOL! hahahaha! Thank you Andy. I wish I thought so, but I want that ‘hair’. LOL! I love both of the photos, what a charming pair. Two great photos, Andy, but the one of your bedraggeld dog steals the show for me. he’s lovely. He obviously likes a good swim! He certainly looks well on it. Swimming is my sport of choice too, so I understand how Jake feels when he sees water! Lovely captures, Andy. The Daisy and the bee is my favourite! And Likewise to you Andy! I think I was scrolling through your various posts, as opposed to an individual post of yours, Andy. On some wordpress template themes, it is not so easy to find the comment button. Thanks for sorting me out!!! !